And oh did we enjoy them. When I first made these, back in 2009, they were so huge as to be intimidating. The recipe calls for four cups of flour, almost two sticks of butter, cream AND buttermilk, not to mention a pinch of salt; and, stupidly, that first time, I was home alone “recipe testing” so these mammoth biscuits sort of went to waste. It was a very David & Goliath kind of biscuit experience; Goliath won. Fast forward to 2012: Patty (friend Patty; also, seven-months pregnant Patty!) was here this weekend visiting with her partner, Lauren. I offered to cook them breakfast before they departed on Sunday and I realized: I could make Patty her favorite biscuits. You probably can’t tell, but I scored the dough into 16 separate biscuits (four down, four across) and then poured two tablespoons of melted butter on top. 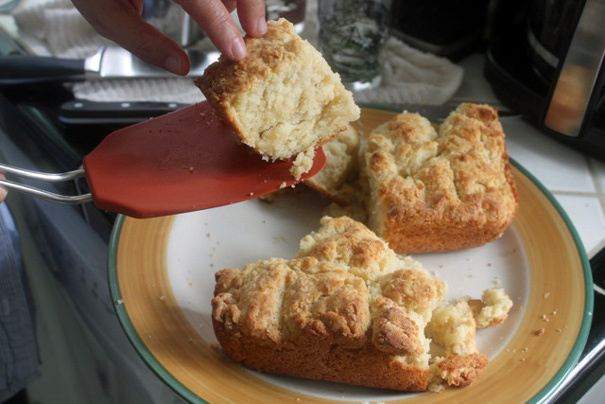 What’s amazing about this recipe is how easy it is: typical biscuit recipes require rolling and folding and cutting, this one is more “whisk, cut, pour, stir, pat, bake.” And the resulting biscuits are exactly as Patty raved back in 2009: buttery, fluffy and AMAZING. 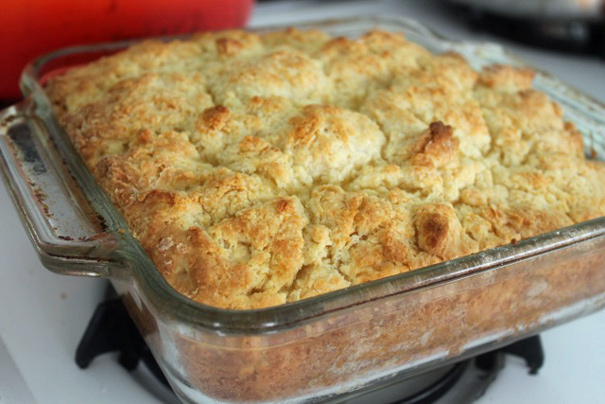 Normally I don’t post breakfast-oriented recipes on Mondays (elaborate breakfasts are for weekends), but what’s great about this biscuit recipe is you can make it ahead, pat it into the pan, cover in plastic and bake it up for a dinner party too. I’m thinking with fried chicken and collard greens; would you say no? 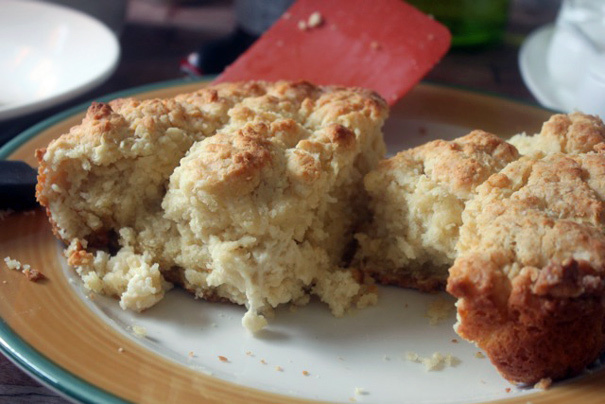 Thanks Patty the Friend for telling me about these biscuits; and thanks Patty from Lynn’s Paradise for sending along this terrific recipe. Summary: Mammoth biscuits from Lynn’s Paradise Cafe in Lousville, Kentucky. Spray a 9 x 9-inch pan with veggie spray. 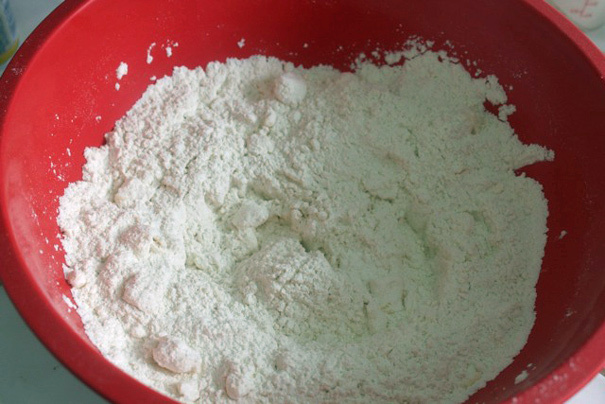 In a large bowl, place the flour, baking powder, salt, and baking soda. Cut in the butter by hand until it resembles coarse oatmeal (I used two steak knives, slicing across the bowl; you could also use a pastry cutter). 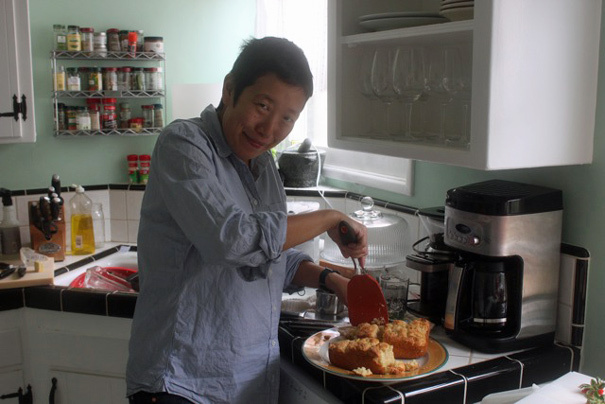 Do not over work the dough or it will form a tough biscuit. Pour the heavy cream and buttermilk in, in a steady stream. 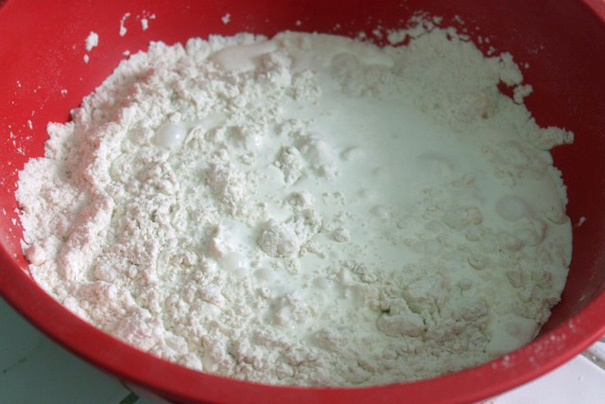 Using your hand (a spatula if you prefer), gently mix all of the butterrmilk and cream in just until well blended. The dough will be slightly sticky. If it is too tight you can adjust it by adding just a little more cream. Scoop the dough into the prepared pan and spread evenly. Use a gentle patting. Do not press the dough down. 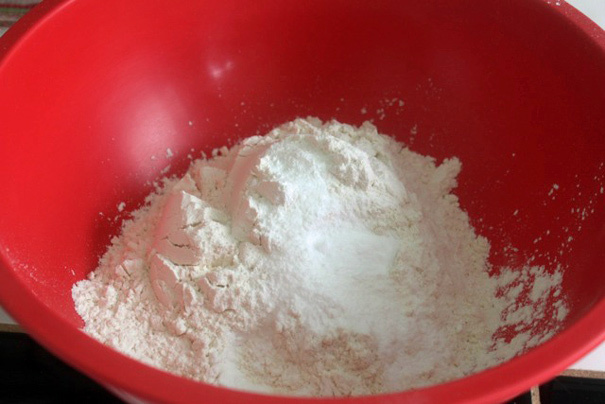 When it is evenly pressed, including into the corners, you can pre-divide the dough. Using a sharp paring knife that is slightly wet you can proceed to mark the dough. 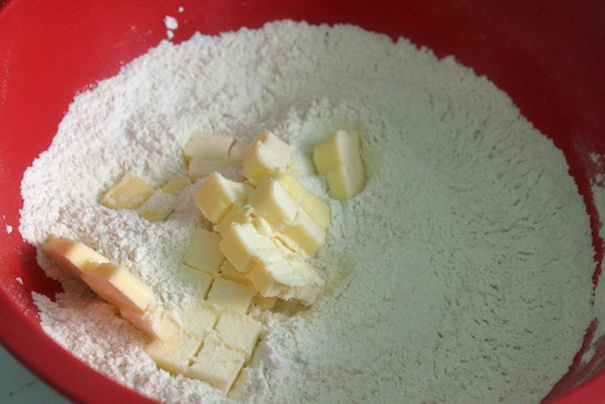 Mark the dough by cutting 4 across and 4 down. Brush with the 2 tablespoons of melted butter. 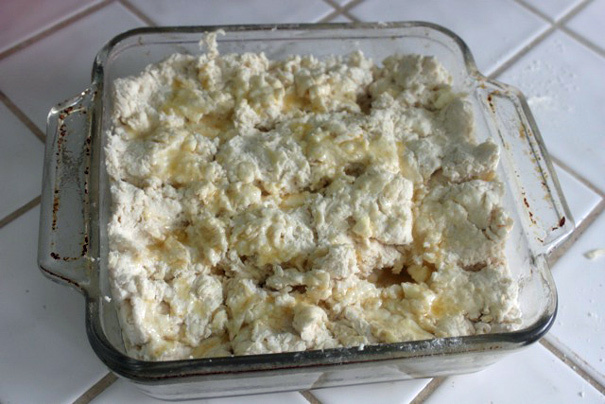 Place in the preheated oven and bake for 25-30 minutes.